Wanneer Radium-223 wordt toegevoegd aan andere behandelingen zoals Abiraterone en enzalutamide bij hormoon resistente in de botten uitgezaaide prostaatkanker dan geeft dat een betere overall overleving, minder pijn en betere kwaliteit van leven. Ook geeft de combinatie Radium-223 plus denosumab langere overall overleving. Mediane overall overleving was langer bij die patiënten die ook abiraterone, enzalutamide, of beide ontvingen in vergelijking met die patienten die geen van deze medicijnen kregen: (mediane overleving = nog niet bereikt versus 13 maanden) en in vergelijking met die patiënten die denosumab ontvingen blijkt Radium-223 (Xgeva) mediane overleving nog niet bereikt versus 13 maanden. De meeste graad 3 bijwerkingen waren bloedarmoede bij 32 (5%) patiënten, thrombocytopenia bij 15 (2%) patiënten, neutropenie bij 10 (1%) patiënten en leucopenie bij 9 (1%) patiënten. Totale aantal ernstige bijwerkingen (graad 3 of meer) werden gemeld bij 243 (35%) patiënten. Dit blijkt uit de resultaten van de ALSYMPCA studie. In deze open label studie kregen 696 patiënten minimaal 1 keer een injectie met Radium-223 De injecties werden iedere 4 weken gegeven tot maximaal 6 injecties. Andere behandelingen en of medicijnen werden toegestaan. Totaal 403 patienten ontvingen alle 6 de injecties. median overall survival was 16 months (95% CI 13–not available ). For patients with no reported baseline pain (median NA, 16 months–NA) than for those with mild pain (median 14 months, 13–NA) or moderate–severe pain (median 11 months, 9–13). and in patients who received radium-223 plus denosumab (median NA, 15 months–NA) than in patients who received radium-223 without denosumab (median 13 months, 12–NA). Het volledige studierapport: Radium-223 and concomitant therapies in patients with metastatic castration-resistant prostate cancer: an international, early access, open-label, single-arm phase 3b trial is tegen betaling in te zien. In the previously reported ALSYMPCA trial in patients with castration-resistant prostate cancer and symptomatic bone metastases, overall survival was significantly longer in patients treated with radium-223 dichloride (radium-223) than in patients treated with placebo. In this study, we investigated safety and overall survival in radium-223 treated patients in an early access programme done after the ALSYMPCA study and before regulatory approval of radium-223. Between July 22, 2012, and Dec 19, 2013, 839 patients were enrolled from 113 sites in 14 countries. 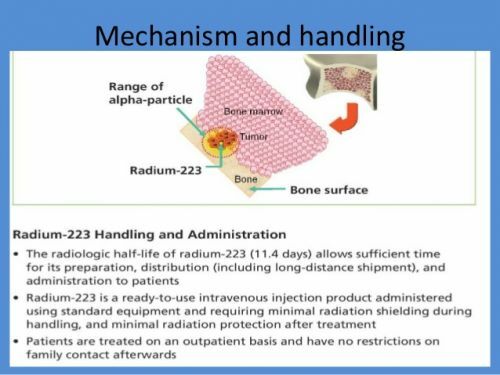 696 patients received one or more doses of radium-223; 403 (58%) of these patients had all six planned injections. Any-grade treatment-emergent adverse events occurred in 523 (75%) of 696 patients; any-grade treatment-emergent adverse events deemed to be related to treatment were reported in 281 (40%) patients. The most common grade 3 or worse treatment-related treatment-emergent adverse events were anaemia in 32 (5%) patients, thrombocytopenia in 15 (2%) patients, neutropenia in ten (1%) patients, and leucopenia in nine (1%) patients. Any grade of serious adverse events were reported in 243 (35%) patients. Median follow-up was 7·5 months (IQR 5–11) and 210 deaths were reported; median overall survival was 16 months (95% CI 13–not available ). In an exploratory analysis of overall survival with predefined factors, median overall survival was longer for: patients with baseline alkaline phosphatase concentration less than the upper limit of normal (ULN; median NA, 95% CI 16 months–NA) than for patients with an alkaline phosphatase concentration equal to or greater than the ULN (median 12 months, 11–15); patients with baseline haemoglobin levels 10 g/dL or greater (median 17 months, 14–NA) than for patients with haemoglobin levels less than 10 g/dL (median 10 months, 8–14); patients with a baseline Eastern Cooperative Oncology Group performance status (ECOG PS) of 0 (median NA, 17 months–NA) than for patients with an ECOG PS of 1 (median 13 months, 11–NA) or an ECOG PS of 2 or more (median 7 months, 5–11); and for patients with no reported baseline pain (median NA, 16 months–NA) than for those with mild pain (median 14 months, 13–NA) or moderate–severe pain (median 11 months, 9–13). Median overall survival was also longer in patients who received radium-223 plus abiraterone, enzalutamide, or both (median NA, 95% CI 16 months–NA) than in those who did not receive these agents (median 13 months, 12–16), and in patients who received radium-223 plus denosumab (median NA, 15 months–NA) than in patients who received radium-223 without denosumab (median 13 months, 12–NA). Reageer op "Radium-223 samen met abiraterone of enzalutamine geeft langere overall overleving dan alleen Radium-223 of alleen andere behandelingen bij uitgezaaide vergevorderde prostaatkanker"